Wet room Shower Enclosures: Advantages & Considerations. Wet room Shower Enclosures, also referred to as “Wet rooms” are becoming more and more desirable. They’re also a great way to add value to your home. 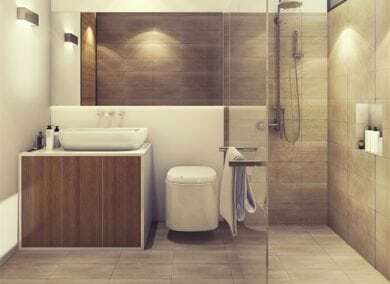 How do Wet Rooms differ from traditional showers? Wet rooms are basically bathrooms which offer an open, fully tiled, waterproofed shower area. When deciding on installing a wet room, it is important to ensure that you use professionals to design and install this for you. Water drainage and the best waterproofing over entire floor area is critical to ensuring no hidden problems with your bathroom. Easier to clean, offering a more hygienic solution. No difficult areas to clean where grime can build up. The accuracy in waterproofing is generally much more efficient and effective than standard bathroom builds. This offers better protection against damp or mould issues. It is recommended to install undertile heating in your wet room as the heat generated from the floor will speed up the drying time, which once again makes it easier to keep clean and mould free. We issue a PS3 Certificate from the council on completion of the project. Still not sure if a Walk-in Shower is a good option for you? Feel free to speak to our team and they will provide you with all the information, considerations and advise to help you make an informed decision.